Dlamini and Lewthwaite hold a one-shot advantage over Sunshine Ladies Tour rookie Casandra Hall and India’s Tvesa Malik, who tied for third on one-over. Fifth on her own on two-over is another rookie campaigner, Brittney-Fay Berger, while former champions Stacy Bregman and Bertine Faber share sixth with reigning South African Women’s Long Drive champion Lenanda van der Watt on three-over 75. 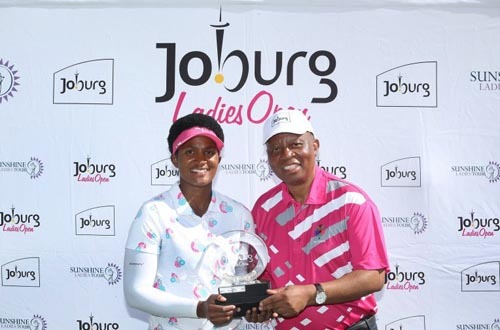 Coming off a runner-up finish in the Jabra Ladies Classic last week at Glendower, Dlamini has forged an almost unsurmountable lead on 1 597 point. Second placed amateur Kajal Mistry is skipping the season-finale to compete in the Western Province Amateur Championship. Lewthwaite is nipping at Dlamini’s heels in third, but another strong push in Soweto will see the Swazi national seal the deal and pocket to the R100 000 bonus in the season-long points-race. A steady two-under start through six holes was good, but her round quickly turned spectacular with an ace at the par three 17th. The ‘perfect fluke’ helped Lewthwaite to go out in four-under 33, but coming home she dropped shots at the fourth and seventh before a disastrous double on her final hole (the ninth) saw her lead evaporate. Despite her poor finish, Lewthwaite remained positive about her opening salvo in Soweto. “It’s a pity I couldn’t finish better, but it’s the best position I’ve been in after the first round this season so I’m right where I want to be,” Lewthwaite said. Dlamini, meanwhile, produced a quieter scorecard with just two bogeys offset by two birdies. That was despite overpowering a number of holes as she cut doglegs with the driver and even driving the par four 16th – where she could only manage par. “I hit quite a few drivers, there are some holes where you can take a Tiger-line,” said Dlamini. “You can still find the ball if you miss the fairway, the challenge is just how close you can get it to the hole with your approaches. The second shots are the challenge. 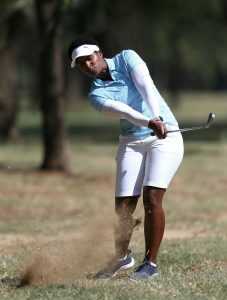 Malik was more than pleased with her effort in just her third start on the Sunshine Ladies Tour after debuting in the Investec SA Women’s Open in Cape Town and contending in the Jabra Ladies Classic last week. “I thought I played a little bit better than my score suggested. I made a few silly mistakes, but I’m happy with my score,” said Malik. Former SA Women’s Amateur Stroke Play champion Hall was equally pleased with an opening 73. 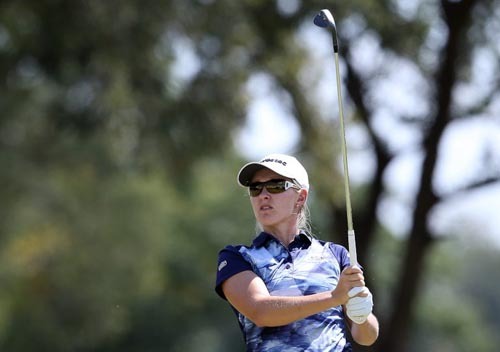 “I made a really good start in my debut in the Canon Sunshine Ladies Tour Open and then I set my expectations too high,” said the Benoni golfer. “The next six events were a steep learning curve, but I felt my confidence return at Glendower last week.